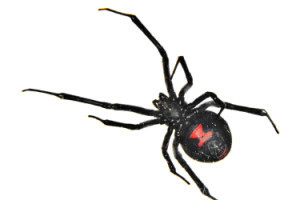 During warmer months, black widows are commonly found in dim, covered places, such as in wood piles, under foliage, as well as in basements and outbuildings. During colder months, they seek more shelter, which is when many business owners will spot them indoors. After mating in early spring, the female kills the male and lays a large number of eggs within a gray-colored, haphazard sac. Anywhere from 200 to 900 eggs are contained in a sac, but only a few will make it to adulthood to reproduce. Feeding on other insects mainly, even baby black widows are carnivorous when hatched. Because they are venomous, the black widow spider should be treated with care. Indoors, use a vacuum to remove the spider and/or the egg sac. Outdoors, gloves should be worn. Black widow spiders are elusive, and unless provoked, they typically keep to themselves; however, for safety reasons, it’s important to keep them out of your space. Smaller spider with six eyes, and a distinct fiddle shape on it’s back. Their markings are distinct. A black line running from the thorax connects to a violin shaped marking pointing toward the back of the spider. 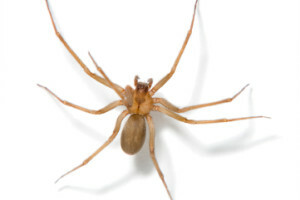 Brown recluse spiders are very secluded pests. Adult spiders only live for about two years, but females produce multiple egg sacs during warmer months, each containing approximately 50 eggs. While they remain in their web most of the time, this species is known to leave at night to hunt – males more than females. While less than 50% of brown recluse spider bites result in severe illness and injury, they are poisonous and should be approached with care. If you see a brown recluse in your business, we recommend calling Strategic Industries for an inspection. Prevention is the best way to counteract an infestation, and inspection by trained specialists who are adept at locating and eliminating adult spiders and breeding sites.